Welcome to Schofield Interiors Limited. 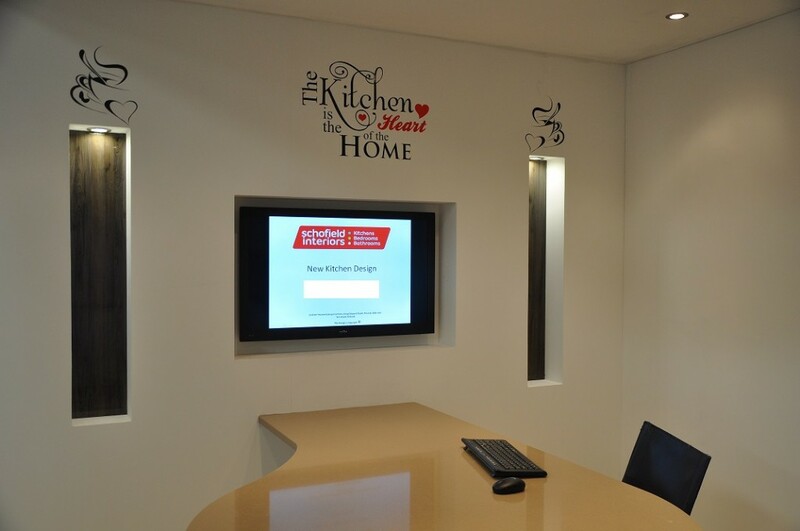 James and Debbie have over 25 years of combined experience creating kitchens, bedrooms and bathrooms. We can create your dream kitchen, bedroom or bathroom. All our kitchens and bedrooms and bathroom cabinets are manufactured using only the highest quality materials. James & Debbie have built up an excellent reputation based on quality and reliability of our products and an excellent customer service. Please feel free to visit our new showroom on King Edward Road in Thorne where you will find a very friendly atmosphere where we can discuss your ideas. We will then work closely with you to produce a no obligation design for your kitchen, bedroom or bathroom using our state of the art technology. We also offer a door and worktop replacement service to give your Kitchen a new look without the new kitchen price tag. Whatever your kitchen, bedroom or bathroom needs, we are here to help… “Quality,Value & Trust”. Our new Client Presentation area.